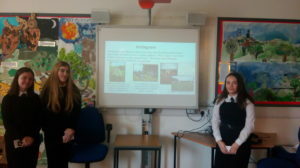 Rachel was blown away this m orning by the work of St Johns Nat 5 Administration students and Greenhillock Glamping staff. 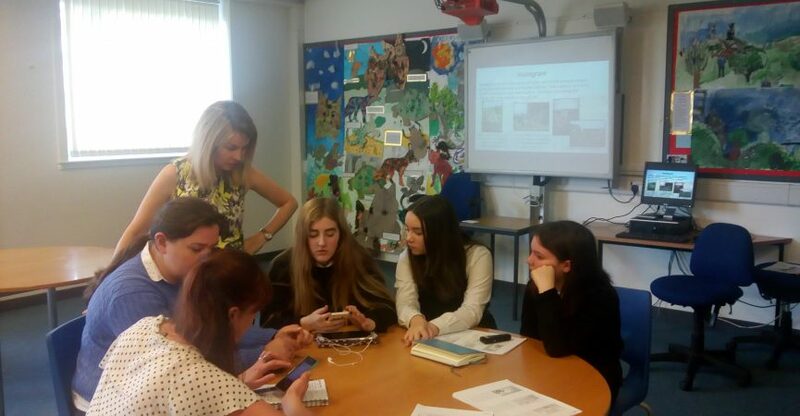 A brilliant example of Developing the Young Workforce activity; students Aimee Adams, Casey Sloane and Anna McMahon delivered training to Kate and Beth of Greenhillock so that they can use social media as an effective marketing tool. The students get the invaluable experiences of engaging with a real local business, of working to a brief, of researching, of presenting and of exploring social media as a marketing tool. Greenhillock Glamping gain CPD for their staff and a new marketing opportunity as well as getting to engage with and give back to their community. Greenhillock Galmping are just beginning their second year as a local accommodation provider in Angus. Rachel from the DYW team was fortunate enough to meet them at several events in the area. One of the things that became clear very quickly was that Kate and Stig were determined to connect with the local area and particularly engage with local young people. DYW was more than happy to help such an enthusiastic, passionate and fun company to do just that. DYW don’t want to just benefit young people, we want to make sure that local businesses also benefit from their engagement so we began looking at areas where young people could potentially help Greenhillock. Social media was an obvious choice. 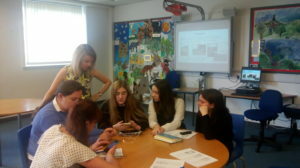 Through DYW connections with all 16 secondary schools across Dundee and Angus, Rachel put out the opportunity for schools to engage with Greenhillock. St John’s were the first ones to snap it up. Rachel helped Mrs McCafferty (the PT of Business studies and Administration) and Kate to connect and work together to develop a project for the students that would benefit everyone involved. 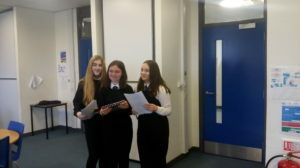 A brief was created for the new S4 pupils, a project which would take them from the change of timetable at the end of May to the end of term at the end of June. Something that they could sink their teeth into in the short period of time, but which could be completed and reflected on as well as enjoyed. The brief that was created also provided the students with a good overview of the whole course, providing context and setting them up for the next academic year. All of the new S4 students, across 2 different classes, were given the same brief, Kate even recorded a short video, laying out Greenhillocks requirements. Greenhillock needed the students to research the market and train their staff; What social media platforms existed, what platforms were best for Greenhillock and why, how to create a brand and what their competitors were doing. Within each class small teams formed who addressed the brief. Each team delivered a presentation of their conclusions to their teachers. From these the teachers determined the best presentation. This group then had the opportunity to present to the Greenhillock staff. Kate and new employee Beth attended the training on Friday 23rd June along with Rachel from DYW and Mrs McLagan, the head teacher. The students did brilliantly, explaining the dif ferent types of social media available and making convincing cases for which ones Greenhillock should use and how. They then patiently answered all of our questions and took us through creating an Instagram account for the business and posting the first image on their story. Kate and Beth certainly learned something and left with ideas bubbling over. 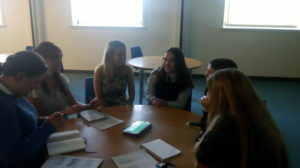 Rachel spoke to Aimee, Casey and Anna as well and found out how much they enjoyed the project. 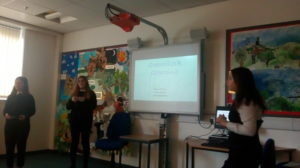 Although they were nervous about giving the presentation they did so admirably and all said it was good experience. They appreciate the opportunity of working with a real business and could see how what they were learning now would be with them even after they left school. 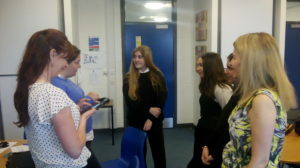 The girls explained that all of the students taking part in the project got stuck in and enjoyed it and that everyone would like to do work like this (engaging with a business) again. Kate and Greenhillocks are passionate about this type of engagement and have very generously said they will come into the class again over the course of the year. Engaging with students and working with them on events planning, on entrepreneurial work and more. This social media marketing training is an exemplar of DYW work. Everyone involved benefited. Everyone enjoyed themselves. Greenhillock are not a multi-million, international company, they are a local business who want to engage with their local area. St John’s were very grateful for the opportunity and it is something their students will remember and be able to use through-out their educational and working lives. If you are at all interested in this type of project or have any ideas yourself, don’t hesitate to get in touch with the DYW team.